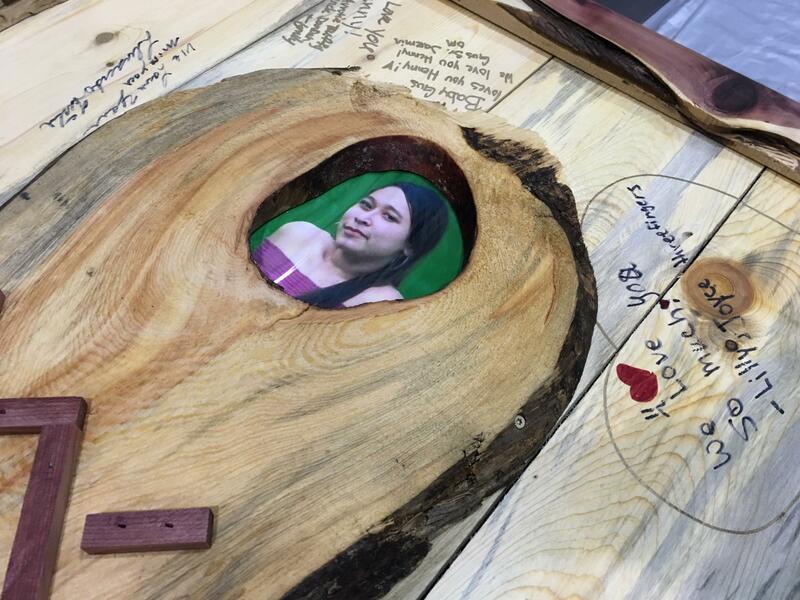 Picture of 14-year-old Henny Scott, of Lame Deer, inlaid in wood at her funeral. Scott's body was found in December. As Congress considers bills to address the epidemic of missing and murdered indigenous women, reservation communities are tired of waiting. Today, Northern Cheyenne tribal members are holding the third memorial march for a young girl whose body was found in late December, three weeks after her mother last spoke to her. Local activist Dean Wallowing Bull said families want justice, and they’re tired of feeling alone in trying to get it. People in Lame Deer on the Northern Cheyenne reservation are looking for solutions from within the community. Wallowing Bull said volunteers have formed a group that uses social media and word of mouth to find loved ones if they go missing. “They’re taking our ideas that we talked about at the community meetings, and part of that was people spreading out to look around, to look out, to reach out, to their friends, to their family,” said Wallowing Bull. Other indigenous communities are also trying to generate answers internally. The tribal council on Flathead Reservation in western Montana recently formed a workgroup to brainstorm possible solutions to the epidemic of missing and murdered indigenous women and girls. Native American communities hope for a quicker and more efficient response to ongoing and emerging cases. Dean Wallowing Bull says the third memorial march for Henny Scott is aimed at keeping the issue at the forefront of people’s minds. Legislators appear to be paying attention. Bills that could address how law enforcement agencies respond to reports of missing and murdered indigenous people are before the Montana state legislature. One would require the employment of a statewide missing person specialist. Another would put more stringent requirements in place when a child’s family reports him or her missing by requiring law enforcement to submit that child’s information to a national database. It could also allow guardians to submit information to the database once they file a report with authorities. A documentary that draws attention to violence against indigenous women will be screened in Billings next week. Roughly 70 people gathered in Lame Deer Wednesday on what would’ve been Henny Scott’s fifteenth birthday. Scott’s body was found late last month near her community on the Northern Cheyenne reservation in southeastern Montana. She is one of many indigenous women and girls who have gone missing across North America in recent years.